I woke up before 4 and tried to go back to sleep but I can tell when it's a hopeless cause. I had a good eight hours of sleep...that's enough. I love this part of the day. I like to watch the sky go from black to soft gray to opal. Every morning, I come out and turn on the Christmas tree lights, the fireplace, and I drink the last cup of coffee from yesterday heated in the microwave. 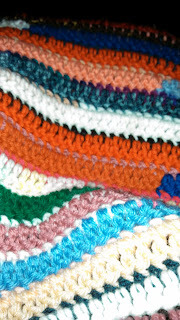 I wrap myself in my new rainbow afghan and a warm hat and I wait for morning to come. Regis and Gus come out to join me. Gus has a habit of jumping into Regis's lap for a while in the morning. They watch the rabbits and the birds in the yard and wait for morning to come. Sometimes Gus gets a little grooming. I have a hankering for coffee cake this morning so might have to make one. It's been a long time but the smell of brown sugar and butter is enticing. I've decided to take a leave of absence from my job at River Rock. I didn't work many hours anymore and I could do much of it at home, but it took a lot of thinking time and I didn't feel that I had that too spare. Now, I can think about the healthy things: cooking, eating, exercise, and good strong state of mind. A Facebook poster who I read quite often says that cancer has enriched his life. Enriched his life by the people he has met and connected with, by the experiences he has had, and by the new way of looking at his life. He would never have invited cancer into his life and like I have said, he wouldn't sign up for it again, but all in all, it's been interesting and I guess I could even say enriching. I've met a lot of people online, Caroline and Karen, some through blogs and some I'm not even sure how we met. 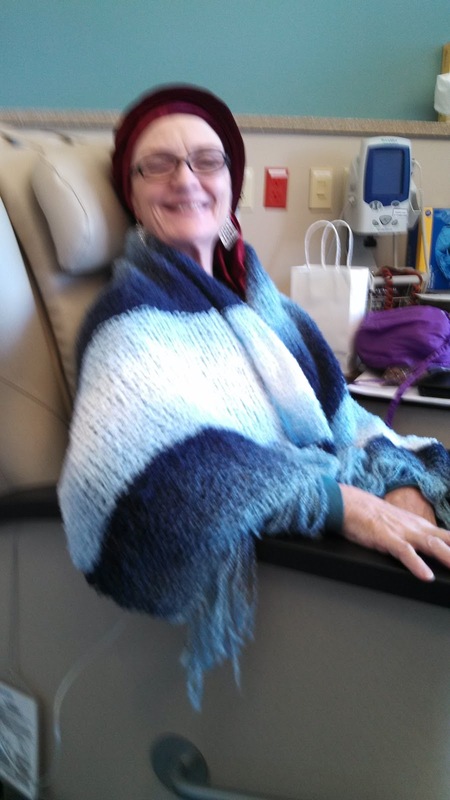 I've connected with lots of women in town who have cancer or had cancer in the past, Mary, Nancy, MaryAnn, and have been willing to share their stories and their support. For all of these folks, I am grateful. Linda and Stu, old friends, have sent email and pictures of their Christmas in Missouri. My family has been good about calling me, Mom, Bruce, Pat and Helen, Deb...and sending things to cheer me up: fresh, homemade lefse, surprise packages, massages. My Aunt Liz and Cousin Joanna from Arizona sent the beautiful prayer shawl in the photo above. 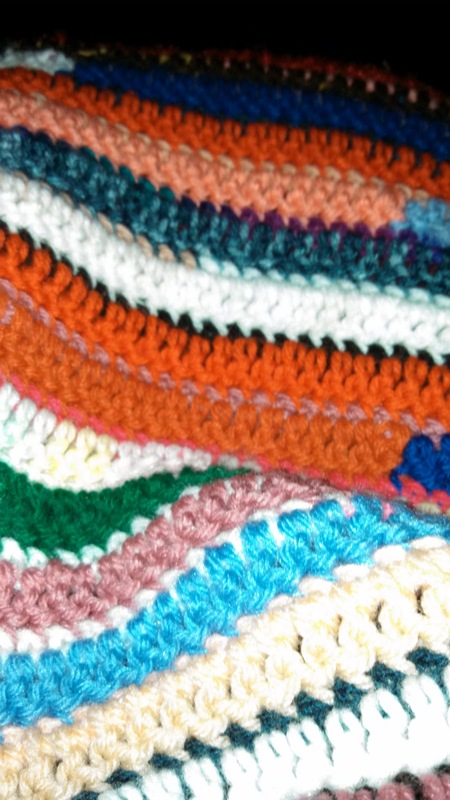 Emily's mom sent a beautiful and wildly colored afghan that I love and carry from room to room with me. Friends in town have brought things: chicken soup with Amish noodles from Keith and Corinne, tomato and squash soup from Montana and Sam, granola from Josh and Tamika, a scarf from India from Kemmie and Joanne. Anders, who lost his sweet wife to cancer some years back, brought me a bag of her beautiful scarves to wear. That is my gratitude post for the day. Thanks to Winston for the inspiration and for all my friends and family who have been so good to us. Bless your hearts.